Balboa Park. Get ready for a cultural experience of a lifetime. Balboa Park is the premier attraction in San Diego CA. Covering 1,200 acres, it is the nation's largest cultural park located just minutes from downtown San Diego. The main section of the park is	El Prado, a long and wide promenade spanning the center of the park. El Prado is where you will discover the cultural attractions of major museums and spectacularly colorful and lush gardens. It's charming and ornate collections of museums were built in the early 1900s in the rich Spanish Colonial Revival architectural style. buildings among some recreational picnic type areas. A lady by the name. Kate Sessions had a plant nursery that was open-viewing by the public. Sessions is often referred to as "the mother of Balboa Park." She brought in many varieties of native and exotic plants and trees some of which were donated to the city and planted throughout the park. Many of those rare species are still growing within the park. Other attractions from this era was the first children's park with walking trails and a bird aviary. The spawning of Balboa Park began with ground-breaking in 1911 to build cultural attraction venues anticipating the much anticipated 1915 Panama- California Expedition Fair. The Expedition was a celebration of the completion and opening of the Panama Canal. In addition to the one-of-a-kind museums, the Cabrillo Bridge was built across a major canyon connecting the central section of the park with other portions of the park. On December 31, 1914, The Panama-California Exposition opened, with Balboa Park 'crammed full' of amazed spectators. The heart and soul of Balboa Park. El Prado is a boulevard where most of the park's major museums, theatres, gardens and iconic landmarks are located. Among those are the San Diego Museum of Man, Museum of Photographic Arts, San Diego Museum of Art, San Diego Art Institute, San Diego Model Railroad Museum, San Diego Natural History Museum, San Diego Historical Society, Reuben H. Fleet Science Center, and the Timken Museum of Art (admission is always free). Other cultural attractions along El Prado are the Reflection Pond, the latticed Botanical Building, and the Bea Evenson Fountain. Adjacent to the promenade is the San Diego Air & Space Museum. Balboa Park's Theatrical and Musical Venues. The following attractions are also along El Prado: The Spreckels Organ Pavilion, featuring the world's largest outdoor pipe organ, where you can enjoy free performances on Sundays at 2:00 PM and Monday evenings during the summer at 7:30 PM. Shakespeare's Globe Theatre and the Casa del Prado Theatre which is home to the San Diego Junior Theatre. Balboa Park Gardens and Landscape. A stroll around Balboa Park just gazing at the gardens is an experience. If you don't have time to visit the museums, you can spend a rewarding afternoon just walking around and relishing the charm of old Spanish architecture and astounding beauty of colorful gardens will embed visions that will enlighten the soul. In addition to the gardens and beautiful, ornately designed buildings, you can walk beneath an urban forest of rare trees. Feast your eyes on the gardens including Alcazar Garden, those in the Botanical Building, Cactus Garden, Casa del Rey Moro, the Rose Garden, Japanese Friendship Garden, and the Zoro Garden. Balboa Park also has a sports complex, picnic areas, hiking trails in the canyon and the Balboa Park Municipal Golf Course. Although it is a separate venue, the San Diego Zoo, one of the largest in the world is on the Balboa Park grounds. A bit of advice for vacationing visitors. It is impossible to enjoy all that the El Prado section has to offer and visit the San Diego Zoo all in the same day. Riding Tram Central is a great way to see the park. A tram departs "Inspiration Point" about every 8 to 10 minutes each day. There is a convenient parking lot near the departure point. The tram stops at most of the park's popular venues which include the Prado, Sefton Plaza, Quince Street, the Organ Pavilion and Pan American Plaza. Brochures are available at the Visitor Center which is one of the stops. Schedules change with the various seasons. Call (610) 235-1100 for daily schedules and more information. The Balboa Park grounds are open 24 hours a day. There are no fees to enter the grounds, the Botanical Building or to view most of the gardens. Nominal fees are charged to enter the museums and vary by each museum. The Balboa Park Visitors Center is located in the National Historic Landmark House of the Hospitality Building and is typically open from 9:30 AM to 4:30 PM daily. The Center has brochures, maps, and audio tours, and provide information about recreational activities, park event, and kid's activities. Free Park guided tours are available from the Visitor's Center. Save money. 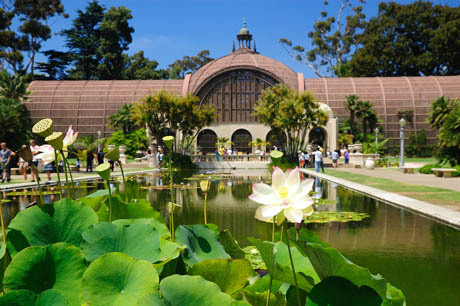 The "Passport to Balboa Park" permits visiting all of the museums during a week period. Two of the museums are always free. The "Deluxe Passport" provides one ticket to the zoo with a guided bus tour, Skyfari aerial tram ride, plus a seven-day admission to 13 museums. These passports can be purchased at the Visitor's Center or any participating museum. Passports are not available at the zoo. Call (619) 239-0512 for information or visit the Balboa Park Website for more detail. Click the following to access a map layout of Balboa Park showing location of all venues, tram stops, restaurants, museums, gardens, parking lots, taxi stands, public transportation, restrooms, ATM machine locations and other points.